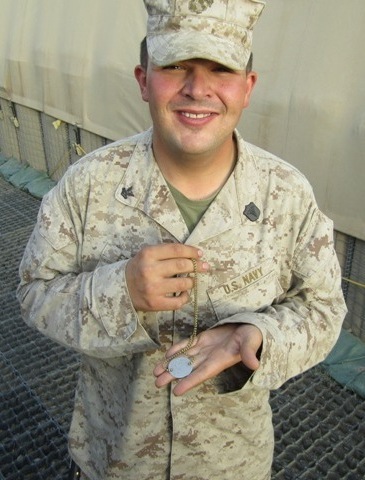 Sangin, Afghanistan – Hospital Corpsman 2nd Class Richard Erfurth, a corpsman assigned to 1st Battalion, 5th Marines, was cleaning out a storage trailer used by the battalion aid station when he came upon something he knew was special. 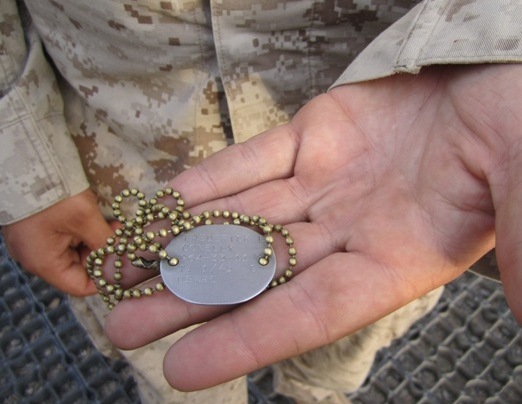 At the bottom of an ammo can that was stuffed with random care package items like toothbrushes, lip balm and snacks, he spotted what looked like a very personal item – a steel plate about the size of a silver dollar on a brass ball chain. Frederick E. Conelly, as it turned out, died 14 years ago, according to the first family Erfurth found and called after looking his name up at ZabaSearch.com. But Conelly’s grandson, Cpl. Dawson Webb, is very much alive and had misplaced the tag while he was in Sangin on his last deployment with 3rd Battalion, 5th Marines, the unit that was here before 1/5. Webb, who is stationed at Camp Pendleton, Calif., happened to be on leave at his aunt’s house in Arizona when Erfurth’s call came in. Erfurth is the kind of guy who likes to get to the bottom of things, but this time it felt especially important. That’s a true Corpsmen, they don’t stop toll the job is finished! Very very kool. I wish someone would find and return my Zippo, from 1968, with my initials, service number and dates. Greg….I have a spare zippo…not your original…but a zippo still…let me know where to send it…Patty…have yourself a good AND proud cry…you deserve one!! Too cool! Love stories like this. Way to go soldier angel. Say HI to my son, Scott. Hospital Corpsman 2nd Class, Petty Officer 2nd Class, or even HM2. Hospitalman stops being used once a Corpsman reaches E-3, nonetheless, good story. This is a remarkable story and postive which is a good thing these days. I love a story like this. In this case a Corpsman did the right thing and it paid off. Great job. Hooah! Richard, I just discovered a gold mine. What awesome story! You can make a great archaeologist, so join my club. Welcome home!